Cultivate a Healthy Relationship with Your Body. 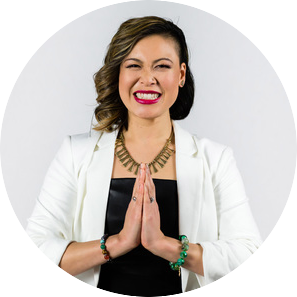 Rosalyn Fung is a Self-Love Coach for Women and Entrepreneurs and founder of Holistic Body Love Coaching Inc. Having a background as a Psychologist for the last 11 years and holding a 2nd degree black belt in karate, she knows what it takes to develop a mindset to successfully achieve your goals in life and business. She is also certified in Eating Psychology and Hakomi Method, a mindfulness approach to shifting limiting blocks. She’s the go-to person to help you understand how to break free from food & body image struggles, as well as concerns related to: confidence, weight, self-image, intimate relationships, and relationship with money. When you have a healthy and nourishing relationship with food and your body, self-care habits, and high self-worth, you create more balance and abundance in life. In our interview, Rosalyn shares what it looks like to have a healthy relationship with our body and with food. You might be surprised, but a healthy relationship with food doesn't necessarily mean no binge eating! It does mean, however, that when we do binge-eat it does not overcome us with shame and guilt. If you want to learn a few simple and powerful ways to truly love your body and be kind and compassionate to it, this is the talk you need to listen to. Get many of Rosalyn's free offerings on her website's Freebies page, including the 5-day video series Embrace your inner badass. VIP ticket holders can purchase Rosalyn's flag e-course Holistic Body Love for $97 (worth $497). Holistic Body Love 6-modules e-course. ​Get your VIP ticket now to access your coupon code.